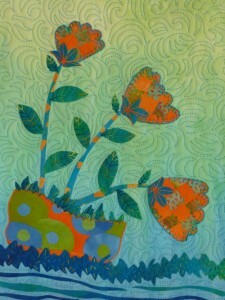 Build a blooming garden from colorful fused fabrics. Learn basic fusing techniques like free-cutting, bias fusing, collage building, and pattern transfer. Celebrate the joy of improvisational design and create your flower composition with a kit of hand-dyed fabrics and sampler of embroidery threads. It’s fun, it’s easy, and no sewing machine is needed. – Iron and ironing surface (share with other class members if not provided by group). $25 Kit Fee: Includes hand out, pre-fused hand-dyed fabrics, embroidery threads and a needle. Student work from the Half-Day Garden of Eden class.